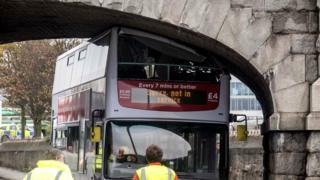 A double-decker bus has become wedged under a bridge in Aberdeen. The accident happened on Riverside Drive at the Wellington suspension bridge on Friday afternoon. The road was blocked as a result, causing rush hour tailbacks in the area. No passengers were on the bus at the time of the collision and there were no reports of any injuries. Operator First Aberdeen has promised to give "every assistance" to investigators. A spokesperson said: "We can confirm that there were no passengers on board this vehicle when it collided with the bridge on Riverside Drive. The vehicle was not in service at the time. "First Aberdeen is currently assisting with the recovery operation. "It is too early to know the exact details of what happened but we will be providing the police with every assistance in their investigation into the circumstances."